Data backups are all the rage nowadays because prevention is better than cure: it is often cheaper to simply spend on backups than to endure additional difficulty trying to survive a data loss event. As with any business expense, data backup services need to be rationalized and accounted for, hence the need for a return on investment (ROI) assessment. Determining the ROI of a data backup solution is tricky because backups don’t directly contribute to profitability and are more of a future-cost-saving measure. To rationalize spending on backups for your business, compare the advantages it provides against any perceived disadvantages. If the savings are greater than the costs, then it can be said that the return on that investment is a good one. A more cost-effective backup solution is the use of managed IT, which often package migration, backups, data management, and security into one service plan. Downtime is a necessary evil when implementing data backups because it takes time to migrate data to backup servers. Most backup managers will also prefer to pause operations while migrations are underway to mitigate risk. The natural cost of downtime is lost sales. An easy way to measure this is by multiplying average sales per hour by the number of hours used in the migration process. This can give you an idea of what you could have earned while operations were paused. Backup solutions cost money, especially if you decide to perform backups yourself. Onsite backups require servers for storing and managing data, and servers require IT technicians and facilities to ensure that everything is working properly, and that the hardware has ample cooling and protection from physical and virtual threats. If you work with a managed services provider (MSP) such as Xirtix, you no longer need to hire additional staff to cover your IT needs. And given that one IT technician can be worth upwards of $3,200 per month in salaries (the average rate in Houston), this cost-saving feature is difficult to ignore. Tower servers can cost between $200 and $5,000 depending on brand and storage size. With an MSP, you simply decide whether you want a traditional server setup, a cloud setup, or a hybrid (mixed) setup, and they will provide the storage type for you. MSPs can help optimize workflows by removing the burden of data management from your employees. This means more time and resources go to tasks that actually generate sales and income for you. This is an added benefit of managed storage, as there are very few MSPs that will offer to provide storage services that ensure your data’s utmost security. Most providers will have better security systems than what you can afford, as it is, after all, their primary line of work. Use this to your advantage. You’ll know you’ve made a good investment if the savings and benefits outweigh the costs. If it feels as if there were more savings and benefits than the total amount spent on the provider, then it’s a good return on your investment. Xirtix Consulting offers XCare Managed Services that provide comprehensive IT and data management, including backups. 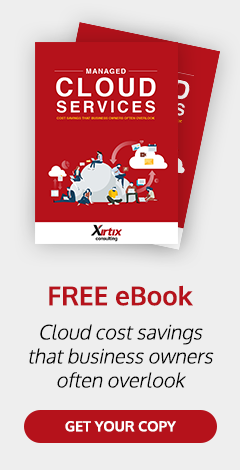 Xirtix’s managed services solution has a subscription-style pricing model. This means costs are uniform from month to month, versus large capital costs that are necessary when procuring hardware such as additional servers. It is Xirtix Consulting LLC CEO Nick Dragna’s aim to reduce all technology challenges to two items: Strategy and Process. Wrap our Trademark XCare Managed Services around your IT solutions to simplify your technology challenges. Get in touch with us today and have Your IT. Managed. Period.